Rona Rona is easy to kill and hard to chase when she jumps so use your stun ult on her to make her stop and give time for your allies to come and damage her. Vox Vox is not much of a damage dealer and he is easy to kill. Just be careful of his ult and his abilities and don't go all easy around him, he can be sometimes surprisingly good it depends. Ardan Ardan is a tanky hero,a strong hero and he's not easy to 1v1 him especially in late or midgame, he's hard to chase. Get a reflex block for his ult when he traps you. Try to save your stun when he's the only one alive. Ringo Ringo is easy to kill.get reflex block for his ult and atlas for his basic attacks or his twirly silver, and when you fight the enemy wait for him to come then kill him. Try to focus on him because he can melt you and your allies easily. Skye Skye is not much of a big deal,tho she still can damage you. Try to reflex block her ult and use your ult when she tries to run. Focusing on her can easily damage her and finish her off quickly. 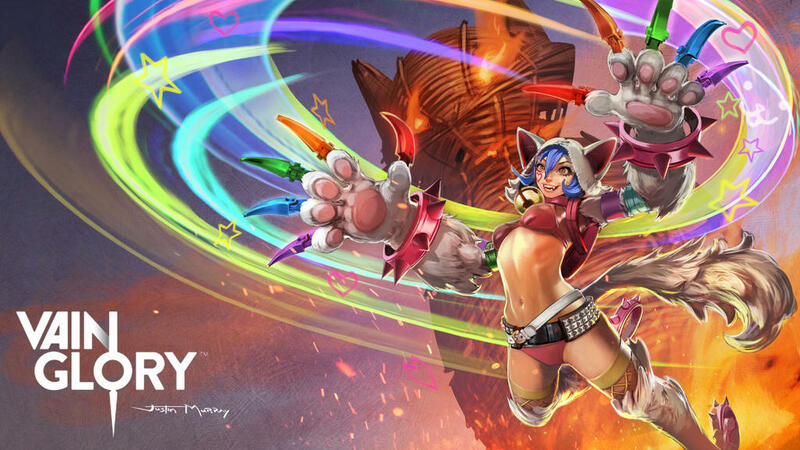 Koshka An enemy Koshka? Bring the game on! Try to focus on her using your stun because Koshka is a big threat for your team. Use reflex block to cancel her ult and get away when your low on health,fountain of renewal can help you reduce the damage because of the kinetic shield,once you have retreated health your back on track to kill the enemy Koshka. Celeste Celeste is very easy to kill with her low defense she's dead in seconds but her stun and her stars with her eve of harvest item she can instantly heal her self and when she stuns you she can use her ult and snipe you.try to be stealthy and hide in the bushes and use your ult in the right time. Ozo Ozo, ozo is very Rare in matches but when he comes..ohhh boy.. Try to not up all of the focus on him if he's not really damaging anything, using your stun and abilities on him,make sure you finish him off very quickly because his perk will heal him. Phinn Getting and killing phinn requires an Ally with you because he's tanky and hard to kill. He can pull you back in teamfights when you try to restore health. He can stun you when you try to ult someone and when you run he can jump and drags you back. So besure to use reflex block AND DONT STUN HIM. NEVER EVER even if he was the ,sat hero alive,he will never get stunned. Krul Krul is easy to kill especially in early game. Try to harass him in early game because he will be defenseless + weak. Use reflex block to block his ult and fountain of renewal shall heal you, stun him so you can give your allies time to kill him and Use atlas when needed in. Reim Reim is strong and he's not that easy to kill. He's Like a cp krul ,he restores health very fast so besure to stun him when he tries to run. Don't worry fountain of renewal will help you and your allies in close battles or teammates fights. Make sure to be aware of his root ability and For his ult, get a reflex block! SAW Saw is dangerous in mid+late game,try to hide in the bushes and stealthy.use atlas to reduce his weapon speed and focus on him because he's a huge threat for your entire team. Taka Taka is really stealthy when he hides,and attacks you with his X retsu,he's very weak in early game so try to raid his jungle to get your ult very soon and when he arrives try to damage him,when he disappears use flares and scout traps to reveal him when he tries to run away, I used to stun taka then when he disappears I used twirly death randomly then it revealed him instantly. Glaive Glaive is a Koshka counter, getting atlas and armor will make glaive attacks weak, when he's the main damage dealer try to focus on him and to stun him so he can't damage you and your allies. Koshka twirls, damaging all enemies around her. She gains a boosted basic attack for each enemy hit by the twirl up to (12)for the next 10 seconds. this is really great for Koshka whenever she's low at health..since Koshka is squishy and when she's targeted she can be shot down easily. •the reason why I rocommended Fountain of Renewal, because it's really helpful to Koshka in so many ways. It can heal her and her allies in close/long battles and when/while doing her ult, it tanks Koshka's health a little bit which helps her to survive in long battles. Gives +200 health, +75 shield, and +30 armor when bought. •the reason why I recommended Atlas Pauldron because for the people who has troubles with SAW, Krul and other heroes. Its really useful and if there was an enemy SAW or Krul make sure you get ASAP because SAW is very dangerous with his attack speed and so is krul, but when Atlas Pauldron is used on them, they're weak. Gives +85 armor and +35 shield when brought. • Don't jump or leap to start a team fight, it will cause you an instant death. Instead wait for your allies to start the fight. • Koshka's perk Bloodrush helps her to secure kills while turret diving,she can use her abilities to speed her perk and chase enemies and can escape in the same way. do not risk while turret diving, when your low on health or there's the whole enemy team or the enemy hero has already escaped too far. • Try to farm until, you get to level 6. Koshka's ult Yummy Catnip Frenzy is the best way to kill enemies and to stun them when they try to run away.